The Delta smelt population in the Bay-Delta reached record or near-record low indices in 2016 (Figures 1-3), but ended the year with some promise of recovery (Figure 3). The December 2016 Kodiak Trawl Survey collected 214 Delta smelt in one of its nine trawls, and at least one Delta smelt was captured in each of the other eight trawls. Fall 2016 has been wet following a below normal water year 2016 (October 2015 – September 2016), which followed the 2012-2015 drought. Some early insight into this apparent resurgence in the 2017 index can be gained by reviewing the relationship between the Fall Midwater Fall Index and the subsequent Winter Kodiak Trawl Index (Figure 4). 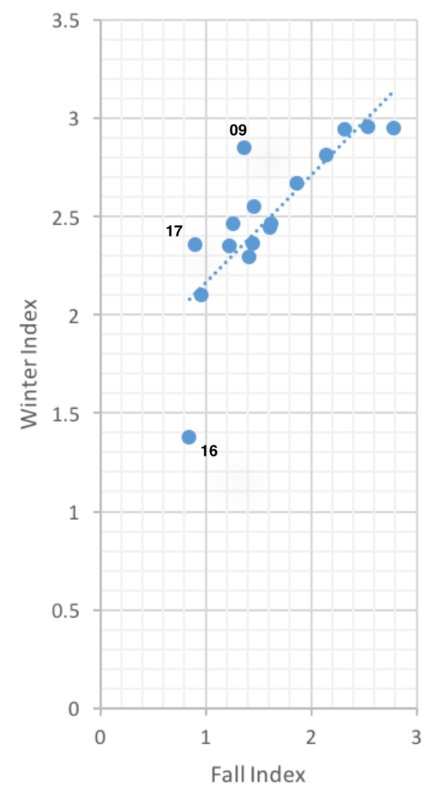 There is a strong positive stock (previous fall index) to recruitment (winter index) relationship with three apparent outliers (2009, 2016, 2017). The poor fall 2015 and 2016 indices resulted in strongly contrasting winter recruitment (winter 2016 and 2017 indices). This likely reflects the benefits of a wet fall of 2016 to the 2017 index (Dec. 2016 survey), as compared to the dry fall of 2015 and subsequent poor 2016 index. Water year 2015 was a critically dry year with extremely low flows. In contrast to 2015, critically dry year 2008 with its low fall index produced a strong winter 2009 index. The strong showing in the winter of 2009 may have been due to the extremely low December (2008) and January (2009) exports, combined with relatively high Delta outflow pulses, a pattern that rarely occurs after a critically dry year. We will be keeping a close look at how the apparent resurgence plays out in 2017, especially with new less stringent export restrictions mandated in recent legislation for the implementation of the two federal biological opinions that apply to Delta water project operations. Figure 1. Summer Townet Index for Delta smelt 1969-2016. Figure 2. Fall Midwater Trawl Index for Delta smelt 1967-2016. Figure 3. Winter Kodiak Trawl Index of Delta smelt 2002-2016, including December 2016 (Water Year 2017). December surveys were not conducted from 2002 to 2014. Figure 4. 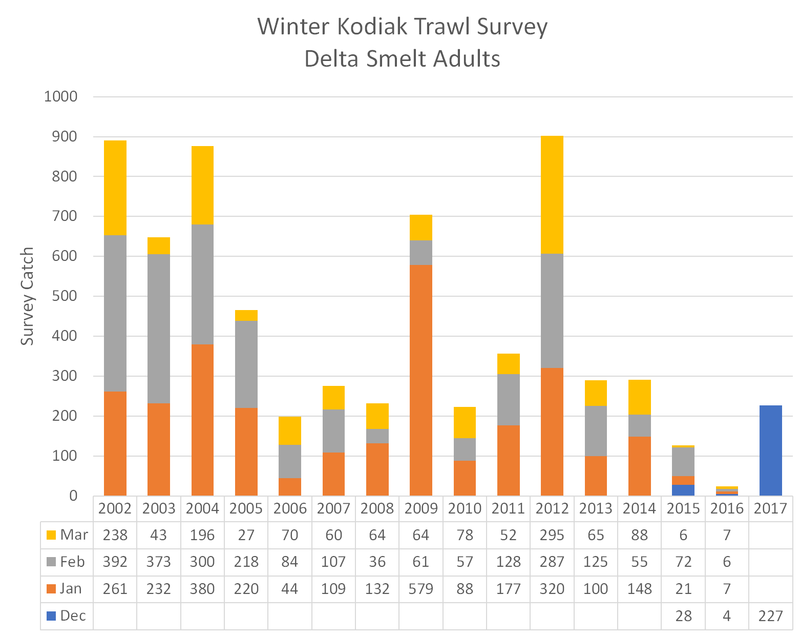 Winter Kodiak Trawl Index versus previous fall Midwater Trawl Index of Delta smelt (log scales) 2002-2016. The 2017 winter index is from Dec 2016 survey only and does not include Jan-Mar 2017 survey results as yet, thus it will likely be even higher than shown. 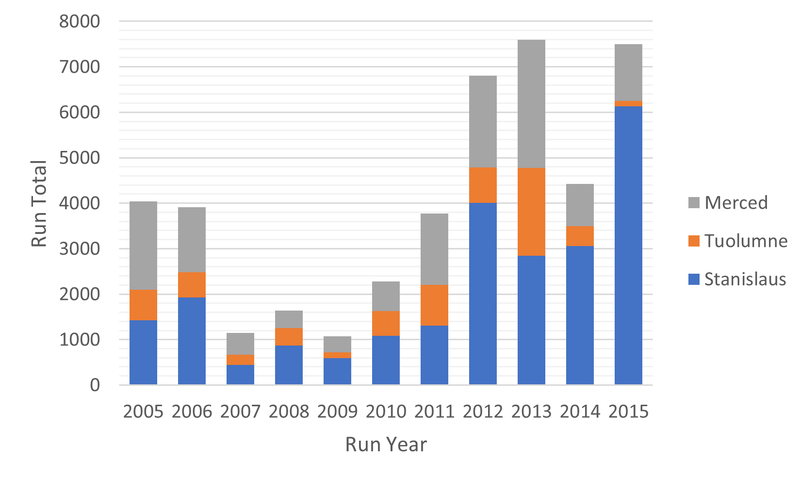 One of the main reasons for the recent decade of run increases is most likely increases in flow requirements in the spring and fall as mandated in the National Marine Fisheries Service’s 2009/2011 biological opinion for the Central Valley Project. 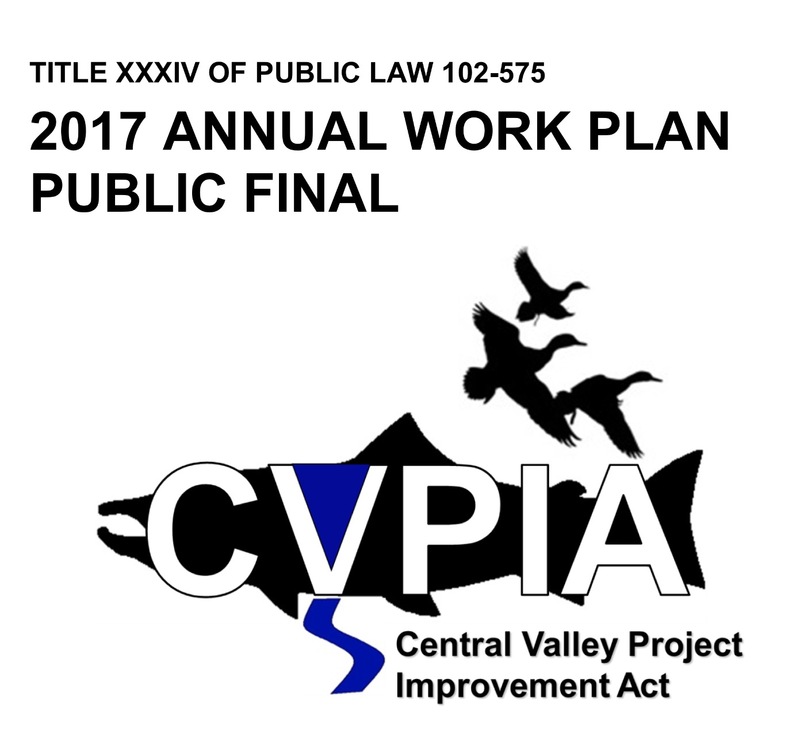 It is more logical that further flow improvements would lead to further salmon enhancements, perhaps even approaching target levels specified in the Central Valley Project Improvement Act of 1992 (CVPIA). There is a long way to go. 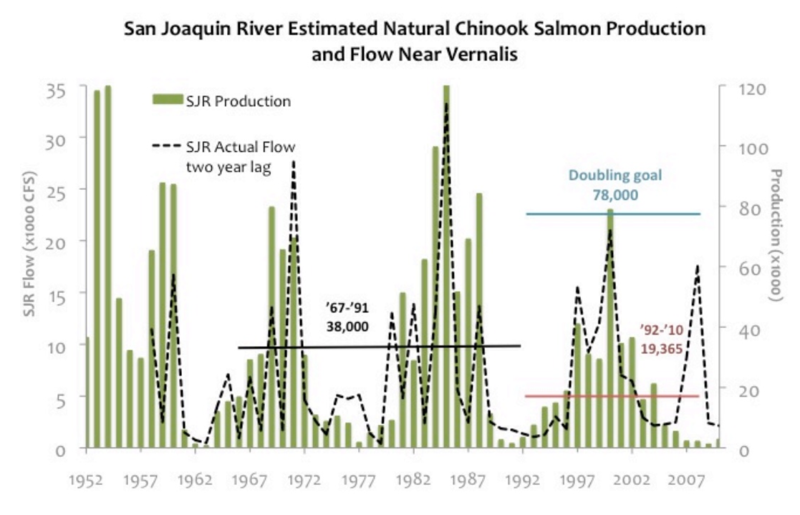 The so-called robust runs are far below the CVPIA target of 78,000 salmon for the San Joaquin, numbers that were most recently achieved in Water Year 2000 (Figure 1). While there have been improvements during the last ten years, eight of which were drought years (Figure 2), runs are still about 70,000 fish short of the doubling goal. In addition, much of the recent improvement is related to increased hatchery production from the state hatcheries on the Mokelumne and Merced rivers (Figure 3). Hatchery production also benefits from trucking hatchery smolts to the Bay. Runs in the Stanislaus and Tuolumne also benefit from strays from the two hatcheries. The CVPIA doubling goal is for natural production. Finally, there needs to be defined fall flow pulses in addition to higher spring flows. Fall pulse flows reduce water temperature in the three tributaries and mainstem during the fall migration period. In the past, drought year fall flows were depressed (Figure 4). This made it harder for fish to find the San Joaquin tributaries and led to high fall water temperatures (Figure 5). High temperatures can block or hinder adult salmon migration, reduce adult pre-spawn survival, and lower egg viability. Lack of fall flow pulses in 2014 and 2015 led to poor salmon escapement, especially in the Tuolumne and Merced Rivers. Higher flows and lower water temperatures in the Stanislaus in 2015 likely led to a greater proportion of the overall San Joaquin run choosing the Stanislaus River (Figure 2). Fall flows from tributary reservoirs should be sufficient to maintain tributary water temperature below 60°F and San Joaquin River temperatures below 65°F. These goals are achievable in most water years, and were for the most part achieved in the San Joaquin River in October, 2016 (Figure 5). Figure 1. 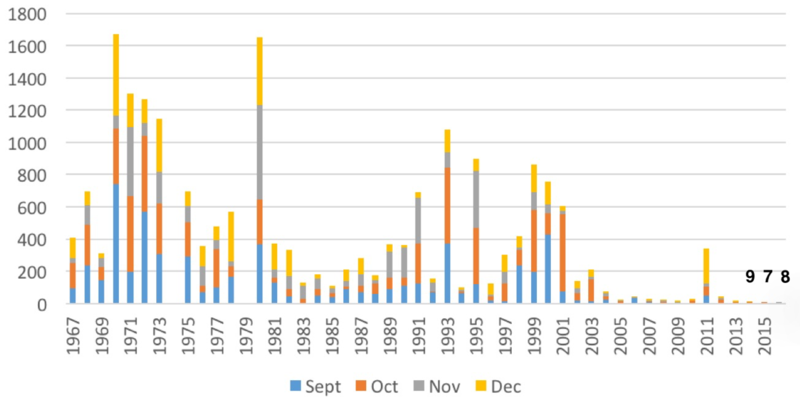 San Joaquin salmon production 1957-2010 as related to flow two years earlier. Source: Appendix C, SWRCB 2012. Figure 2. Salmon run totals (escapement) from the Stanislaus, Tuolumne, and Merced rivers 2005-2015. Data source: CDFW. Figure 3. San Joaquin salmon escapement from 2008 to 2015. Source: CDFW. Figure 4. 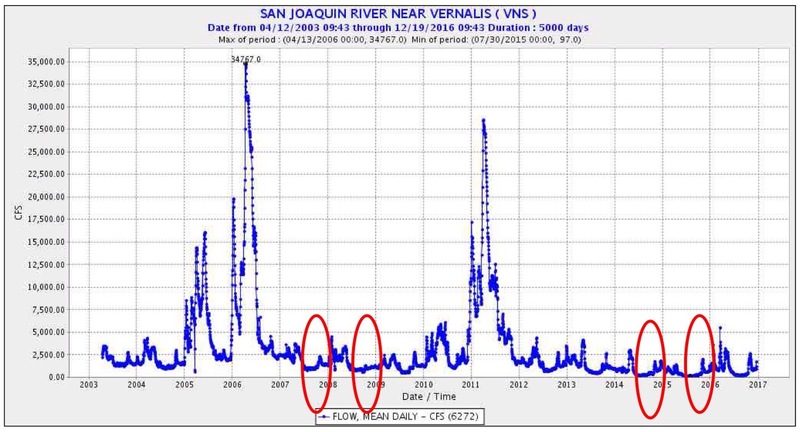 San Joaquin River flow 2003-2016 at Vernalis (downstream of confluence with Stanislaus, Tuolumne, and Merced rivers). Red circles denote drought years lacking adequate fall flow prescriptions. Figure 5. Fall water temperature of San Joaquin River at Vernalis in 2015 (top) and 2016 (bottom). Red circles denotes key salmon migration period when fall flow prescriptions occur. Note higher water temperature in 2015 compared to 2016, which had higher fall flows. Source: CDEC. Over the past twenty-plus years, the US Bureau of Reclamation and the US Fish and Wildlife Service have implemented multiple actions to restore physical habitat for salmon and steelhead in the Central Valley. While these agencies in the Department of Interior have focused much of their efforts on the tailwaters of Reclamation’s federal Central Valley Project dams (Shasta/Keswick, Whiskeytown, Folsom/Nimbus, and New Melones), they have implemented projects on other tributaries as well (e.g., Butte Creek). The overall mandate and effort stems from the Central Valley Project Improvement Act (CVPIA) of 1992 and its sub-element – the Anadromous Fish Restoration Program (AFRP). The Act established the Central Valley Project Restoration Fund (CVPRF or Restoration Fund), which includes the Trinity River Restoration Plan and the San Joaquin River Restoration Plan. Funding comes from appropriations from the U.S. Congress, collections from water and power contractors, and non-federal cost-share obligations. Funding varies annually – the federal share for 2017 projects is budgeted at $22 million.1 Total funding for Interior’s 2017 efforts in the proposed federal budget is approximately $55 million. Major projects for 2017 include stream channel restorations and fish passage projects throughout the Central Valley. With the changes that will come with the new federal government administration in 2017, we can expect many changes to the program, including funding. Setting priorities and funding allocation for the coming year will be a complex process. The state and federal goals and objectives may be in conflict. The 2017 and coming years’ programs will help determine the future of Central Valley salmon, steelhead, sturgeon, American shad, and striped bass. Commercial and sport fishermen will have to be especially vigilant. The whole restoration process has so many components that often are uncoordinated. Resource advocates should seek a stronger role in the process and come together in common purpose. Let’s start by having a strong voice in the future of CVPRF and CVPIA-AFRP. December and January have traditionally been the months when salmon and smelt enter the Delta in large numbers with late fall and early winter storms. Juvenile and yearling salmon pour out of the rivers into the Delta. Heavy rains wash fry, parr, and smolts from their river spawning grounds into the Delta. Sub-yearling winter-run, yearling late-fall, spring-run, and fall-run, and newly hatched spring and fall-run fry abound. Adult longfin and Delta smelt migrate up from the Bay, surfing the tides on their annual spawning runs. These same storms whet the appetite for December exports from the south Delta. In the two decades from 1990 to 2010, December and January exports often reached 11,000 cfs and at times exceeded 12,000 cfs. 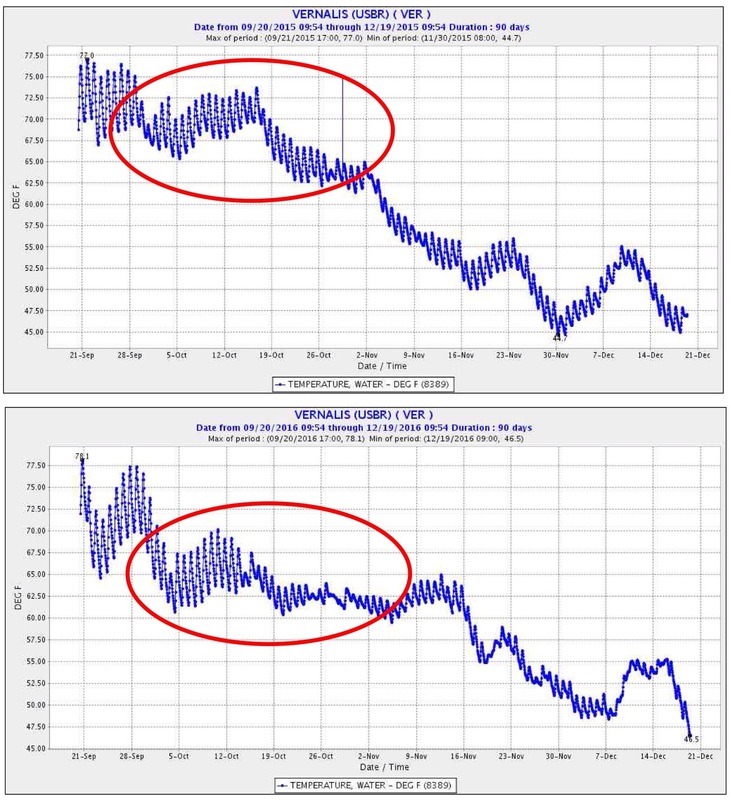 High salvage events occurred for salmon and smelt, reflecting both the abundance of fish and the strong pull of reverse flows toward the south Delta pumps. Precipitous population declines followed, forcing severe winter export limitations (only 1500-5000 cfs) imposed since 2008-2009 by ESA biological opinions to reduce fish losses. Winter salvage at the south Delta export facilities dropped sharply as a result of the limitations, but salmon and smelt populations had already reached record lows, and most remained so or got even worse during the 2012-2015 drought. This year’s fall storms and high December Delta inflows has brought a new regulatory reality to Delta exports. The federal and state governments, under new mandates in the recently-passed federal water legislation, have kept exports high (9000-11,000 cfs) or moderate (5000-7000 cfs) through December, hoping fish would still be protected but allowing water supply deliveries to increase after four years of drought. South Delta salvage has remained relatively low so far, but there are signs of that potentially changing. Smelt surveys indicate a small potential resurgence of the Delta smelt population and the presence of pre-spawning adult Delta smelt in the west and central Delta. The Smelt Working Group (SWG), state and federal biologists charged with advising water project managers, have recommended cutting exports to protect the smelt. Their concern stems not only from the risk of salvage at the pumps, but also from the fact that high exports may draw the smelt spawners into the central Delta where their offspring will be more susceptible to entrainment at the export pumps. All the SWG risk factors appear to be in play in mid-December 2016 (Figure 1). Adult smelt have been captured in net surveys in the central Delta (yellow highlight). The turbidity front (>10 ntu) is approaching the south Delta. Old-and-Middle-River reverse flows (OMR) and exports are about -7000 cfs. Delta inflow and outflow are relatively high. We will all be watching in the coming weeks to see whether what was billed as a “compromise” in the just-passed federal water legislation is protective of salmon and smelt.. If not, we will also be watching to see whether we are in the midst of an important adaptive management experiment that will adjust exports to protect fish, or whether federal managers will instead expect us to adapt our expectations and watch more fish die. Figure 1. Mid-December 2016 Risk factors assessed by the Smelt Working Group in advising federal and state water project managers. Under these conditions, adult Delta smelt are apt to enter the central Delta as they have so far in mid-December 2016 (smelt distribution shown as yellow highlight). Direct risk to adult smelt will increase when the turbidity front reaches the export pumps. The Smelt Working Group (SWG) again this week recommended major cutbacks in Delta exports (about a 75% cutback)1 to protect Delta smelt adults that entered the Delta this past month on their annual pre-spawning migration from the Bay. Managers from the US Fish and Wildlife Service (FWS), in taking formal action on the recommendation as they did in the prior week, did not adopt the recommendation. 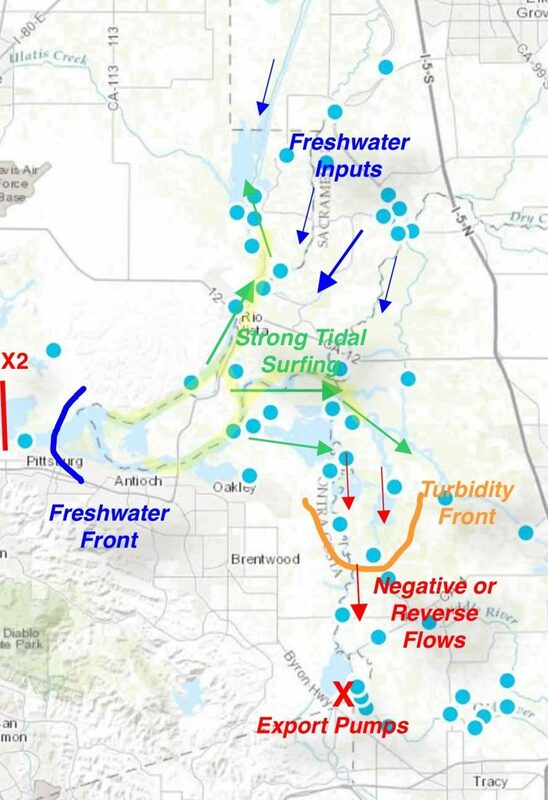 Instead FWS managers maintained a less restrictive regime that allows exports of at least 50% of capacity (5,600 cfs).2 A conflict arises in these circumstances because high Delta inflows from recent storms could be exported at maximum rates (11,200 cfs) to south-of-Delta storage (e.g., San Luis Reservoir) if the restrictions in the Delta Smelt Biological Opinion are not applied. 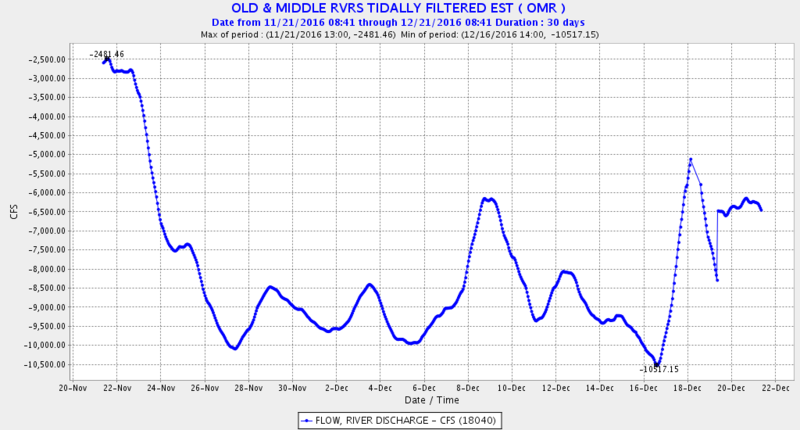 In recent days, Reclamation and CDWR have kept Old and Middle River reverse flows (OMR) at about -6500 cfs (Figure 1) by holding exports at 7000 cfs, but they contemplate increasing exports “if conditions continue to settle following last week’s storm”. The reference to “settle” refers to an expected reduction in Delta turbidity, which has been related to the export entrainment risk to Delta smelt. The “conflict” arises between what the SWG is recommending for 14 days – exports of about 2500 cfs – and what the FWS managers will allow (some amount greater than 7000 cfs). The FWS “does not believe that Action 1 is currently necessary in response to last week’s storm,” whereas the SWG believes action is needed based on the presence of adult smelt as far upstream as Prisoners Point in the San Joaquin channel. The SWG includes FWS smelt experts. The FWS, Reclamation, and DWR managers coordinate on the FWS’s “formal action”.